The roofpond system has always been a dark horse of sorts in the realm of passive solar heating and cooling. Most literature on passive systems will pay lip service to roofponds, but few give credence to the system’s immense potential as exemplified by various case studies with well-documented performance. The reason that the roofpond is often overlooked is two-fold. First, the system has always had a difficult time “fitting in” with any one category of environmental control systems. It can be used for either passive solar heating or passive cooling. The system relies on movable insulation, which makes it a bit of a misnomer to categorize it as a “passive” system. Nevertheless, the roofpond is a very simple system. Secondly, the roofpond concept has always suffered from a few serious practical problems. Over the course of the system’s history, no one seemed to have been able to develop a workable, movable insulation system for the roofpond. Deflection of the insulation panels commonly caused malfunction. Poor seals along the edge of the movable insulation resulted in major thermal leaks. Another problem has been the weight of the water. In the United States, lightweight construction is standard. Heavier roof systems require more robust structure with significant cost premiums. Of course, water leakage is always a concern, but a properly detailed low-sloped roof system should easily overcome this issue. Because the system has the potential for high energy-efficiency and thermal comfort, it is worthwhile to investigate how the various practical problems might be overcome – and several researchers continue to develop solutions to this day. It is also important to recount the vast body of work regarding roofponds. The roofpond’s past is checkered with success and failure. Considering the superior thermal performance of water, it is important to understand how innovators have attempted to utilize water as a building material. Below is a recount of the first roofpond demonstration structure – the Phoenix Prototype – built in 1967 under the watchful eye of the system’s inventor, Harold R. Hay (Fig. 1). Fig. 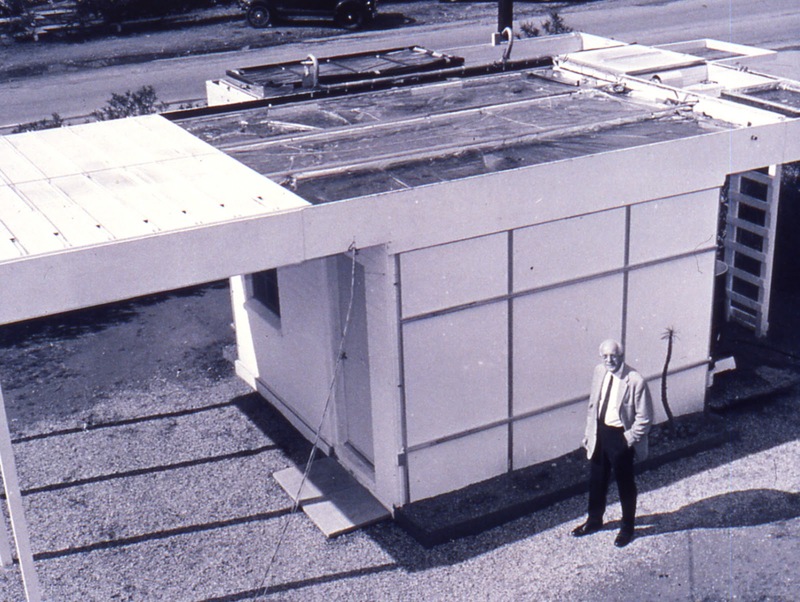 1: Roofpond inventor, Harold R. Hay, stands beside the Phoenix Prototype test structure in 1967. Image courtesy of the Natural Energies Advanced Technology Laboratory at the University of Nevada, Las Vegas. In 1952, Harold Hay served as an adviser to the Government of India. He was charged with improving building materials for low-cost housing. Hay began by studying indigenous materials and methods and compared them to “modern” (i.e.g Western) materials and methods. In impoverished communities where modern air-conditioning was an unheard of luxury, Hay observed that a contemporary material palette did not correlate into greater occupant comfort. “In India, thatch replacement by uninsulated asbestos-cement roofing greatly reduced indoor comfort. Since insulation was not then manufactured domestically, even minimal use was hard to justify,” Hay recalled in a personal monograph published in 1984. In response to this particular roofing issue, Hay conducted an experiment in which he applied movable interior insulation to control the heating and cooling effects through both the asbestos-cement roof and south masonry wall. Hay’s hypothesis proved correct. By manually moving the insulation, occupants could effectively manage heat migration through their building envelopes. Placed at the underside of the roof, the insulation minimized summer heat gain from the high Sun. At night, the insulation was moved to the inside of the south wall. This enabled the interior to release heat upward through the roof. Additionally, the insulation mitigated heat transfer to the interior through the thermally massive south wall which had been soaking up solar radiation all day from the Sun. Hay later determined that movable insulation could serve to manage heat transfer during the winter months as well. Manual daytime placement of the insulation on the south masonry wall impeded early morning heat loss from the interior. Meanwhile, according to Hay, heat radiated to the interior from the Sun-soaked asbestos-cement roofing. At night, the movable insulation was moved to the roof to minimize heat loss while indirect solar heat radiated from the thermally-charged south wall. As with the summer operation, the beneficial effect of the insulation was contingent on its mobility. Hay coined this system as the “Growing House” (Fig. 2). Fig. 2: Harold R. Hay and an archetypal Growing House. Following his assignment to India, Hay took on a series of assignments in Latin America. It was during these assignments that he observed the virtues of applying movable insulation to solar desalination systems (or solar “stills”) (Hay 1984). In later work, Hay began adapting the concept of movable insulation to a water-based storage mass. He conducted preliminary experiments in Tempe, Arizona, in 1966 and 1967 with 2-foot square, 7-inch deep water basins. Horizontal insulation covered the basins during the day, and the water was exposed to the sky at night. Results indicated that 6 inches of water provided adequate thermal storage for year-round air-conditioning (Marlatt 1984). 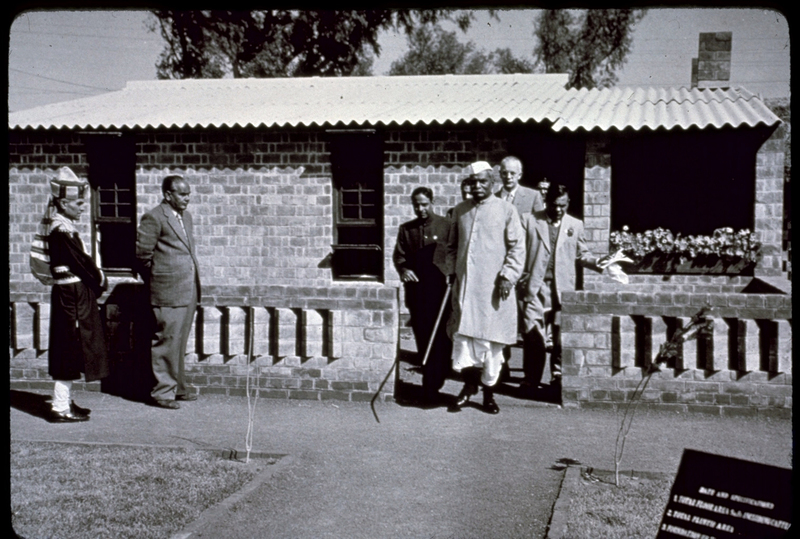 Drawing on his experiences in India, Harold theorized that a combination of movable insulation atop a flat (i.e., slow-sloped) roof comprised of water would yield tremendous thermal comfort in even the the most challenging of climates. After several attempts at branding the system under different names, Hay would eventually coin this strategy as the “roofpond” system. 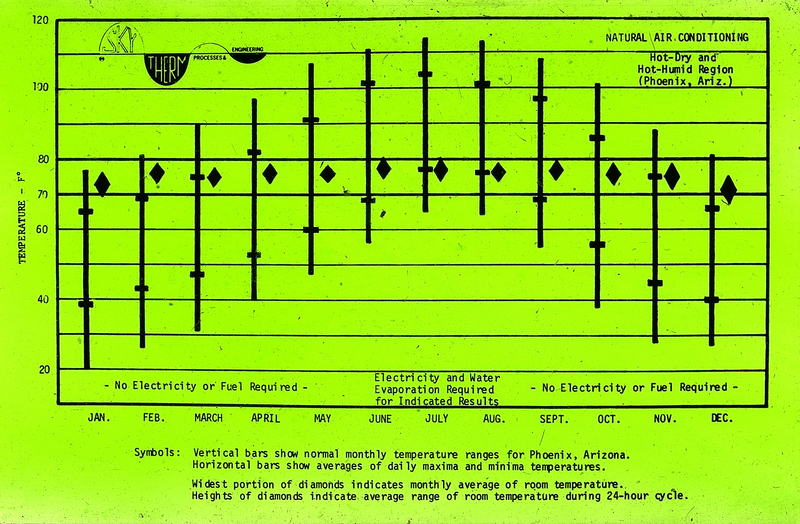 Hay’s experiments with water in Tempe caught the attention of the revered passive solar engineer, John I. Yellott. Thanks to Yellott’s belief in the roopond concept, Hay received an opportunity to test his theoretical system in a full-scale test building in the Sonoran Desert. Fig. 3: General layout of the Phoenix Prototype test building. Hay’s retirement in the mid-1960s afforded him the time to resurrect his solar still and roofpond concepts. Teaming up with Yellott through Arizona State University, Hay established a 10-foot by 12-foot test room to apply his roofpond system. The Phoenix Prototype test building was erected in 1967. Yellott donated property, instrumentation, and advice on thermal comfort standards to Hay. The Phoenix Prototype was a rudimentary 120-foot square structure constructed of vermiculite-filled, lightweight aggregate concrete block walls (Fig. 3). The east and west walls were insulated externally with 1.5-inch panels of rigid polyurethane to “simulate a room within a multi-room structure.” Insulation was used externally on the north and south foundations as well as the 4-inch thick concrete floor slab. A framed “carport” overhung on the south side of the building and served as a storage area for the movable rooftop insulation panels when the roofpond bays were exposed to the Sun. The north- and south-facing walls both contained a 12-foot square window. The entry door was located on the south wall (Marlatt 1984). Three 4-foot by 8-foot panels of 1.5-inch thick polyurethane movable insulation atop the roofpond had to be operated manually by a nylon clothesline with pulleys and a small hand winch. When retracted, the interlocking, 125-lbs panels stacked atop the carport (Marlatt 1984). The use of insulation on the exterior was not recommended by manufacturers but was applied anyway in both fixed and movable configurations. Hay’s experimental solar stills and solar water heaters were separately tested atop the structure – as was a “thermosiphon water-wall” (Hay 1989). The roof was constructed of 26-gauge galvanized, corrugated steel sheets placed between 3-inch by 12-inch beams supported by the wall plate on 4-foot centers. The steel sheets were supported by 2-inch by 3-inch wood beams bolted to the main beams. The three “bays” formed by the beams above the roof were covered with a 10-mil black polyethylene liner, which formed a waterproof seal. The bays were then filled with 6- to 7-inch thick water bags (Marlatt 1984). Fig. 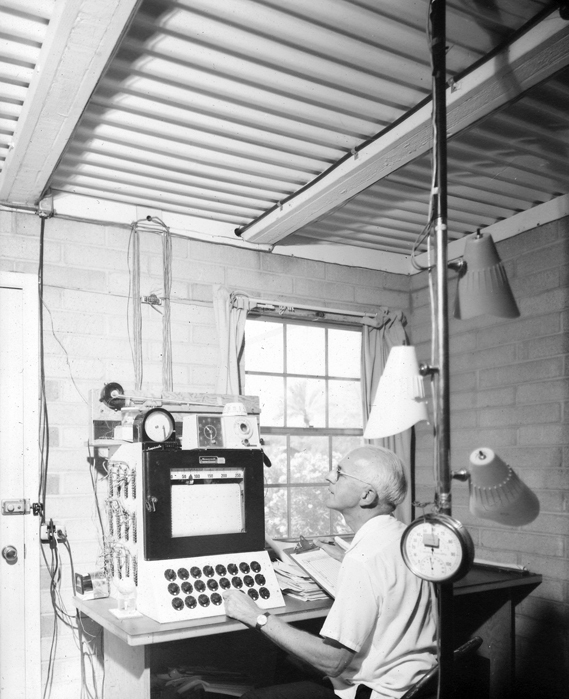 4: Harold R. Hay measuring data inside the Phoenix Prototype test building. According to data published by the Energy Technology Engineering Center in a report contracted by the U.S. Department of Energy (US DOE), the Phoenix Prototype maintained an interior ambient air temperature between 70 and 80°F during approximately 91% of the hours of the year under “normal” weather conditions (as defined by Phoenix weather data). At all times, the interior ambient air temperature was maintained in a range between 68 and 82°F, with daily temperature swings from 4 to 8°F (with extremes of 2 and 12°F) (Marlatt 1984) (Fig. 4). During the three summer months, when temperatures reached 110°F and the humidity was high, a fan coil unit was used to enhance cooling inside the structure by circulating cool roofpond water through the unit. For approximately one quarter of the year, it was not necessary to move the insulation to maintain thermal comfort because the average indoor air temperature stayed within an acceptable range. Fig. 5: Processed data measured from the Phoenix Prototype test building. The Phoenix Prototype was laregley a success and set the stage for continued research into the roofponds. Over the next several years, Harold Hay would realize multiple roofpond test structures in a diverse array of locations throughout the United States. The Energy Technology Engineering Center report contracted by the US DOE would later conclude that well-designed roofponds can maintain comfortable indoor ambient air temperatures in climates with an outdoor temperature range between 32°F (freezing temperature) and 115°F (Marlatt 1984). Hay, Harold R. “100% Natural Thermal Control – Plus.” The Third International PLEA Conference. Mexico City, Mexico, 1984. Hay, Harold R.. “Natural Thermal Control for Innovative City Planning.” Solar Engineering. Ed. A.H. Fanney and K.O. Lund. Vol. H00467: The American Society of Mechanical Engineers, 1989. 139-46. Marlatt, William P., Kathy A. Murray, and Steven E. Squier. Roof Pond Systems. Canoga Park, CA: Energy Technology Engineering Center, 1984.